The pet food extrusion market studied in this report involves the market coverage of extruded pet food and pet food extrusion equipment. 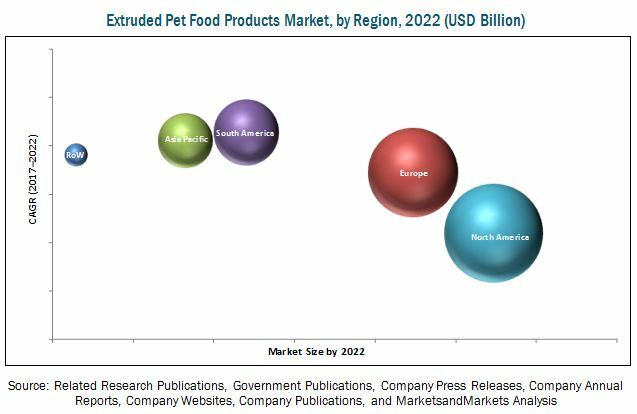 The pet food extrusion market is projected to grow at CAGR of 5.6% over the next five years, to reach USD 72.64 Billion by 2022. During the forecast period, the single screw extruder segment is projected to grow at the highest CAGR, in the pet food extrusion equipment market, in terms of value and volume. Various benefits such as low-cost capital and simplicity offered by single screw extruders have been driving the growth of this segment over the last few years. A single screw extruder offers simplicity and ease of operation, whereas a twin-screw extruder offers versatility and flexibility. Low capital cost and easy maintenance. The South American market is projected to grow at the highest CAGR during the forecast period followed by Asia Pacific region in both the markets. Countries such as Argentina, India, and China are expected to be the leading emerging food markets as well as pet food extrusion equipment. The growth and growth of e-commerce channels and demand for premium and super premium products coupled with the trend of humanization are expected to drive market growth in these regions. The market for pet food extrusion equipment is dominated by key players such as Andritz (Austria), Buhler (Switzerland), Clextral (France), Pavan (Italy), Diamond America (US), Lindquist Machine (US), The Bonnot (US ), Kahl Group (Germany), Baker Perkins (UK), Coperion (Germany), Doering Systems (US), Brabender (Germany), and American Extrusion International (US) while dominated by Mars (US), Nestle (Denmark), and The JM Smucker Company (US).